Below you will find some links to organisations with a focus on assistive technology. 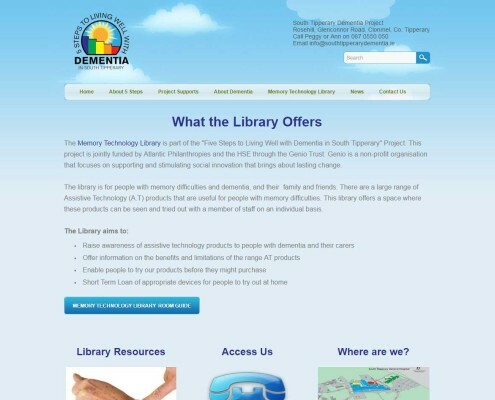 The Memory Technology Library is part of the “Five Steps to Living Well with Dementia in South Tipperary” Project. The library is for people with memory difficulties and dementia, and their family and friends. There are a large range of Assistive Technology (A.T) products that are useful for people with memory difficulties. This library offers a space where these products can be seen and tried out with a member of staff on an individual basis. IATSL develops assistive technology that is adaptive, flexibe and intelligent, enabling users to participate fully in their daily lives. 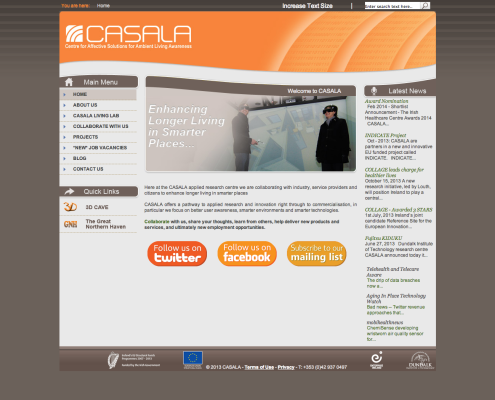 CASALA offers a pathway to applied research and innovation right through to commercialisation, in particular we focus on better user awareness, smarter environments and smarter technologies. Tele Care is a continuous real time monitoring of individuals in their homes providing personal and environmental sensors that enable people to remain safe and independent for longer. 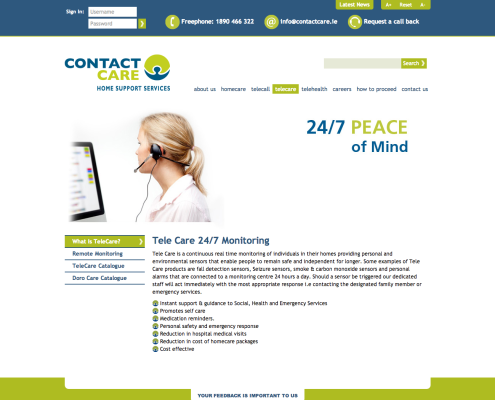 Some examples of Tele Care products are fall detection sensors, Seizure sensors, smoke & carbon monoxide sensors and personal alarms that are connected to a monitoring centre 24 hours a day. Should a sensor be triggered our dedicated staff will act immediately with the most appropriate response i.e contacting the designated family member or emergency services. 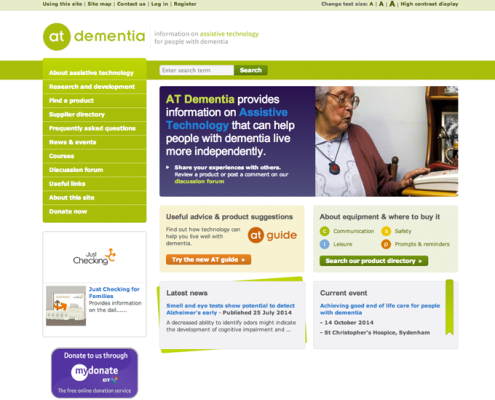 In 2005 Trent Dementia Services Development Centre was funded by the Department of Health to develop an online information resource on assistive technologies for use by people with dementia, carers and professionals. 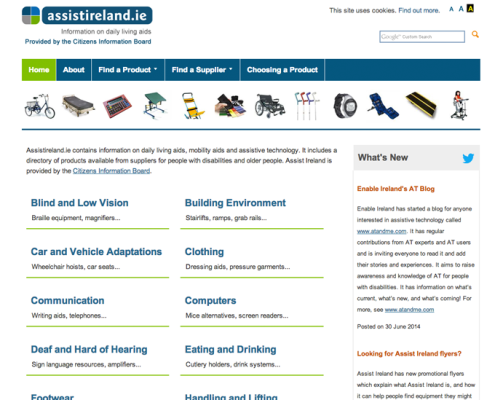 Assist Ireland has been developed by the Citizens Information Board in association with disability organisations, service providers and support agencies both in Ireland and abroad. 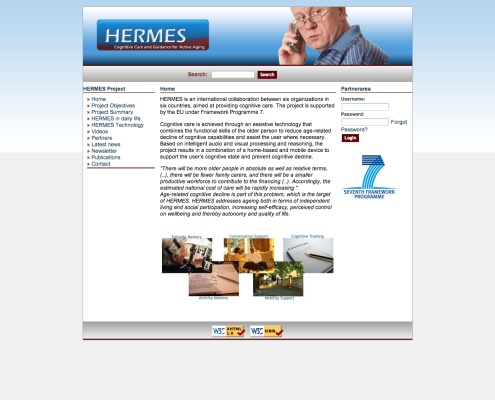 Examples of equipment and daily living aids listed on this website include stairlifts, pendant and personal alarms, wheelchairs, walking aids, ramps and showering and bathing products.